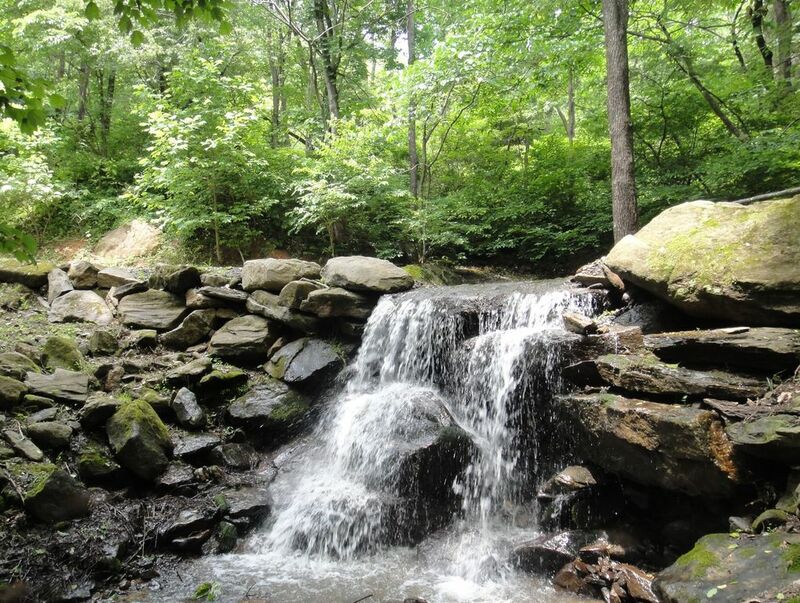 Enjoy the sight and sounds of the cascading waterfall just steps away from this cheerful little cabin in the woods. Relax with the birds and a morning coffee on the porch, or enjoy a soothing soak in the hot tub after a day of adventure in the village of Black Mountain (8 miles), downtown Asheville (8.1 miles), the Biltmore Estate (12.7 miles) or hiking the Blue Ridge Parkway (8 miles). Brett's Falling Waters Cabin can accommodate up to 4 guests in two bedrooms. Pet fees for all bookings are $100.00 for one or two pets. Cleaning Fee is $100.00 and includes hot tub sanitizing scrub out and fresh water refill. Just off the road on 15 acres of private property overlooking a horse farm, Falling Waters has a peaceful, back to nature appeal. The cabin is perfect for honeymooners, couples, hiking friends, or small families who want to enjoy a little solitude and comfort in a private mountain setting, but not too far from restaurants and the nightlife of downtown Asheville. Two bedrooms and one bath, modern eat-in Kitchen. A cozy firebox lends ambiance and warmth to the Living Room with Cable TV and free WIFI. The driveway is gravel, level, and accessible by any vehicle. Your pets are also very welcome at Brett's Falling Waters Cabin. Answers to Frequent Questions: Uber will come here. 4 wheel drive not needed. The cabin is screened from the nearest neighbor and roadway by trees and hilly terrain. The hot tub is available year round and is located on the gated front porch. Shopping and Restaurants: The nearest grocery store is Ingles Market on Route 70, 4 miles from the cabin. They have a full service pharmacy, extended shopping hours, self-checkout, and accept major credit cards. Nearby stores and restaurants include CVS, Okie Dokies Smokehouse, Athens Pizza, Subway and a Dunkin' Donuts. Black Mountain (8 miles) has many wonderful restaurants; we can personally recommend the Black Mountain Bistro, The Trailhead Restaurant and Bar, My Father's Pizza and the Dripolator Coffeehouse on State Street. We are Bob and Lorna, and Brett's Falling Waters Cabin is family owned and managed. We live in Northern Virginia where Bob works for a government contractor and Lorna recently retired from a career in Information Technology. We love to visit Black Mountain and our little haven in the woods. Our staff, Lee and Holly, have cared for the cabin for more than 13 years and take great pride on making your stay enjoyable. The cabin and surrounding property was purchased for our family vacations. The neighborhood includes a working sawmill and horse farm in the Bee Tree Valley, and you will also enjoy the waterfall and small mountain stream at the edge of the property. First offered for vacation rental by Brett (Lorna's father) in 2006, the property and amenities of the cabin are updated on an ongoing basis to ensure the comfort and enjoyment of our guests. Brett's Falling Waters Cabin is a perfect place for a weekend getaway. The waterfall can be viewed from the deck and hot tub, and the general tone of the property is quiet, relaxing comfort. The Cabin is just a quick drive from downtown Black Mountain and Asheville. Uber is also available. Enjoy the serenity of the mountains at this quaint little cabin. We pride ourselves on providing you with a wonderful cabin experience; our staff, Lee and Holly, ensure that the cabin is clean, welcoming and ready for your enjoyment. The cabin is registered with the state of North Carolina tax department. We follow all applicable health and safety regulations. Away from it all but just a few minutes from shopping and restaurants. Horses kept in field below Cabin; nice view of mountains from deck. Bed Linens and Bath Towels; Summer and Winter weight blankets. Hypoallergenic pillows. Prepare an excellent meal in the well-appointed kitchen with full size dishwasher, refrigerator, gas stove, countertop microwave and dish service for eight. Relax in the cozy living room with cable TV and DVD, or enjoy the warmth of the gas log firebox while chatting about the day's adventures. Wireless Internet is available; stay connected by bringing your personal laptop! LOVED THE WATERFALL AND HOT TUB.GREAT AFTER HIKING ALL DAY CLOSE TO ATTRACTIONS / FALLS, HIKING ,CHIMNEY ROCK PARK, BLACK MOUNTAIN.GET THE PIZZA AT MY FATHERS PIZZA IN BLK MTN.BBQ AT OKIE DOKIES .HOUSE WELL STOCKED AND CLEAN.THANKS AGAIN.DUBOIS PA. The cabin was very rustic but functional. It had everything we needed. The sound of the waterfall was awesome. Coming from a big city this was very relaxing and quiet. We greatly enjoyed out stay. Thanks so much for sharing your property with us. We enjoyed our short stay, and it would have been a more perfect stay if not for the weather. Some notes to keep in mind that I missed on the contract is that the hot tub is not prepared January through March unless requested on booking. I was not used to having that in the contract language and overlooked that, but the owner did have someone out later that night when we arrived, and it was heated by the following day. It would help to have that note on the VRBO site ad as well for upcoming guests. One other issue is that the heater would not come on. We used the gas stove as a back up but it turned off on the coldest day there unfortunately. The owner was able to get someone out that night to get it back on, but it turned off again in the middle of the night and got pretty cold inside. I believe both times were related to running the washing machine/dryer on the opposite wall side. It was causing the gas heater to vibrate and I believe that resulted in the gas slider slowly vibrating to closed position. If it happens why staying, check and make sure if that causes the gas to turn off. Thank you for your review of our cabin. In the future, we will inquire as to whether or not our guests want to use the hot tub and not rely on the website or our contract to disseminate that information. We will also clearly state that our maximum cabin occupancy is four persons. The issue with the ceramic log fireplace that you experienced has been addressed. The property couldn’t have been in a better place. Very secluded and peaceful. Owners were very gracious and understanding as we got stuck on the mountain from a fallen tree as we were leaving. We were able to get back in the property and wait until they cleared the road. We will definitely be returning!! We were very happy to accommodate your staying warm and toasty at the cabin while the road crews took care of the tree that had fallen on the road to town. The comfort and safety of our guests is very important! A four-wheel drive vehicle is not needed to reach Brett's Falling Waters Cabin. Full service grocery shopping, ATM, Banking, Gas Stations within 4 miles. Brett's Falling Waters Cabin is just 3 miles from Warren Wilson College and minutes away from the Village of Black Mountain, Montreat College, and UNC Asheville. Go driving and hiking the Blue Ridge Parkway, entry at Milepost 382; Visit the Biltmore Estate, take a Trolley Tour of downtown Asheville, wander the shops of Black Mountain. Pet Fee - $100.00 for one or two pets. Cleaning Fee includes Hot Tub sanitizing and water refill (NC Health Dept.) A $50.00 Fee will be added for Hot Tub use in January, February and March.